Medium frequency (MF) is the ITU designation for radio frequencies (RF) in the range of 300 kHz to 3 MHz. Part of this band is the medium wave (MW) AM broadcast band. The MF band is also known as the hectometer band or hectometer wave as the wavelengths range from ten to one hectometer (1,000 to 100 m). Frequencies immediately below MF are denoted low frequency (LF), while the first band of higher frequencies is known as high frequency (HF). MF is mostly used for AM radio broadcasting, navigational radio beacons and maritime ship-to-shore communication. 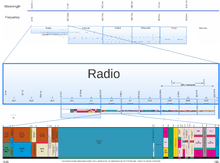 A major use of these frequencies is AM broadcasting; AM radio stations are allocated frequencies in the medium wave broadcast band from 526.5 kHz to 1606.5 kHz in Europe; in North America this extends from 535 kHz to 1705 kHz. Some countries also allow broadcasting in the 120 meter band from 2300 to 2495 kHz; these frequencies are mostly used in tropical areas. Although these are medium frequencies, 120 meters is generally treated as one of the shortwave bands. There are a number of coast guard and other ship-to-shore frequencies in use between 1600 and 2850 kHz. These include, as examples, the French MRCC on 1696 kHz and 2677 kHz, Stornoway Coastguard on 1743 kHz, the US Coastguard on 2670 kHz and Madeira on 2843 kHz. RN Northwood in England broadcasts Weather Fax data on 2618.5 kHz.Non-directional navigational radio beacons (NDBs) for maritime and aircraft navigation occupy a band from 190 to 435 kHz, which overlaps from the LF into the bottom part of the MF band. Propagation at MF wavelengths is via ground waves and skywaves. Ground waves follow the curvature of the Earth. At these wavelengths they can bend (diffract) over hills, and cover a radius of several hundred miles from the transmitter, with longer distances over water and damp earth. MF broadcasting stations use ground waves to cover their listening areas. At night, especially in winter months and at times of low solar activity, the ionospheric D layer can virtually disappear. When this happens, MF radio waves can easily be received hundreds or even thousands of miles away as the signal will be refracted by the remaining F layer. This can be very useful for long-distance communication, but can also interfere with local stations. Due to the limited number of available channels in the MW broadcast band, the same frequencies are re-allocated to different broadcasting stations several hundred miles apart. On nights of good skywave propagation, the signals of distant stations may reflect off the ionosphere and interfere with the signals of local stations on the same frequency. In North America, the North American Regional Broadcasting Agreement (NARBA) sets aside certain channels for nighttime use over extended service areas via skywave by a few specially licensed AM broadcasting stations. These channels are called clear channels, and the stations, called clear-channel stations, are required to broadcast at higher powers of 10 to 50 kW. The most common transmitting antenna, the quarter wave monopole, is physically large at these frequencies (25 to 250 metres (82 to 820 ft) requiring a tall radio mast. Usually the metal mast itself is used as the antenna, and is mounted on a large porcelain insulator to isolate it from the ground; this is called a mast radiator. The monopole antenna, particularly if electrically short requires a good, low resistance Earth ground connection for efficiency, since the ground resistance is in series with the antenna and consumes transmitter power. Commercial radio stations use a ground system consisting of many heavy copper cables, buried a few feet in the earth, radiating from the base of the antenna to a distance of about a quarter wavelength. In areas of rocky or sandy soil where the ground conductivity is poor, above ground counterpoises are used. Receiving antennas do not have to be as efficient as transmitting antennas since the signal to noise ratio is determined by atmospheric noise, so antennas small in comparison to the wavelength can be used. The most common receiving antenna is the ferrite loopstick antenna (also known as a ferrite rod aerial), made from a ferrite rod with a coil of fine wire wound around it. In addition to their use in AM radios they are also used in portable radio direction finder (RDF) receivers. The reception pattern of ferrite rod antennas has sharp nulls along the axis of the rod, so that reception is at its best when the rod is at right angles to the transmitter, but fades to nothing when the rod points exactly at the transmitter. Other types of loop antennas and random wire antennas are also used. ↑ "Ground wave MF and HF propagation" (PDF). Introduction to HF Propagation. IPS Radio and Space Services, Sydney Australia. Retrieved 27 September 2010.